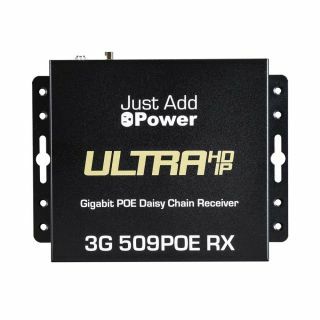 The What: Just Add Power (J+P) announced the new VBS-HDIP-3G 509POE Daisy Chain Power-over-Ethernet (PoE) Receiver—the latest in the company's 3G Series. The What Else: The new J+P VBS-HDIP-3G 509POE daisy chain receiver distributes Ultra HD and 4K video over a single Cat-5e cable without the need for fiber. With the onboard pass-through network port, any PoE device can be connected. A network soundbar, IP TV control, or a single display location can be expanded into a video wall. The receiver also expands the number of PoE devices that can be added to the system by connecting a PoE switch to the port. With the receiver's integrated scaler, video sources can be watched at any resolution, including 4K and Full HD (FHD). It also boasts control end points with RS-232 and IR together with enhanced video wall capabilities with rotation. As with all models in the J+P lineup, the receiver integrates seamlessly with FHD infrastructure, allowing integrators to mix and match J+P devices to build a future-proof 4K system that suits any application requirement. The Bottom Line: The receiver allows installers to add multiple network devices at the endpoint or to add more receivers for highly customized installations. The port also passes PoE to connected devices.